Cross posted from the Metro Mapper blog. One of MTS’s goals is to save the city, and therefore taxpayers, money across all departments. They know that by promoting government transparency and open data by putting data online in a way the general public could understand and use would have a huge ROI by reducing the thousands of FOIA requests the city has to fill. If the public can discover, visualize, and export the data they need online 24/7, then wouldn’t have to contact the city for time-consuming data requests. Another goal of MTS is to create a catalog of raw open data for the public to download and use on their desktop, on websites, and in mobile apps. 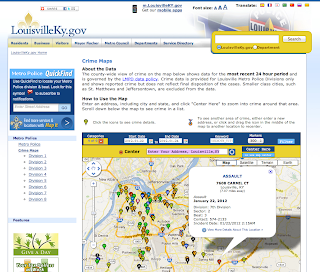 To this end they have Louisville’s Open Data Initiative, which aggregates data across agencies. GovMapper has enhanced their raw crime data by adding latitude and longitude to each report, and then providing the entire dataset for download on the public open data site (see CrimeStats.txt).